USA Batna, RC Bordj Bou Arreridj and Petroliers win the latest games in Algeria. USA Batna edged DRNB Staoueli 56-51 as they fully dominated the first half. The latter replied with a 17-8 run at the end, but could not win the game. RC Bordj Bou Arreridj beat JF Kouba 53-48, while Petroliers rolled over OC Alger 92-49. They erupted with a 29-10 surge at the start and never looked behind after. 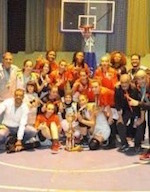 Tunisia's ES Cap Bon secured a second win at the Arab Women's Club Basketball Championship over their Algerian counterpart GS Petroliers 68-58 (first half: 35-30), at a Group A day-2 game played on Thursday in Alexandria, Egypt. The Tunisian club, who had defeated Egypt's Olympique 93-72 at day 1, will play Morocco's AS FAR at day 3 and last in the first round. Group B is made up of Egypt's Al Ahly, Lebanon's Homenetmen, Al-Nasr of Dubae (UAE) and Jordan's Al-Fuheis. All four clubs in each group will qualify for the quarter-finals scheduled Monday but their ranking in that round will make the difference. The semi-finals are scheduled for next Tuesday and the final will take place on Wednesday, October 31. 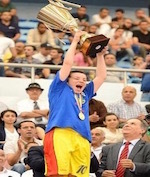 Petroliers celebrate Cup title in Alger beating Marines 74-50. They posted a 19-7 surge at the start of the game and never looked behind. Moreover the favorites added an 18-10 rally in the second frame for a 37-17 halftime advantage. Petroliers scored 22 points in the third period to increase to 32 points after three quarters and looked too strong for their opponent. Marines managed to win the last stanza 23-15, but could not upset the winners.